Why do you need a big 4x4? I have raised that question so many times and invariably the answer involves a challenging road system close to the driver’s home, perhaps a hill or some tight winding lanes that makes he or she think big is best. So for probably most of the year they are occupying a lot of road space unnecessarily and probably have a problem when they confront another large 4x4 coming in the opposite direction on a narrow road already obstructed by parked vehicles. 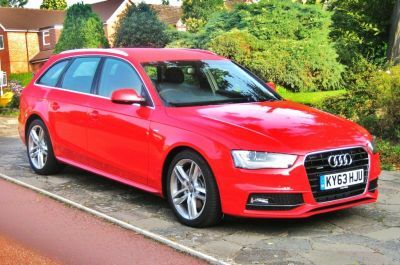 Thus I argue the case for a sensible AWD car like the Audi A4 Avant quattro (AWD) powered by the range-topping 3.0-litre V6 turbo diesel engine. It is just one of a whole variety of AWD variants offered in the extensive Audi range and to my way of thinking it is sized about right for those tight driving situations and with the flexible power (all 242 bhp of it) to tackle most of the challenges on the road. There are also some other Audi AWD offerings set up to cope with moderate off-road situations as well as the really seriously challenging stuff. The A4 Avant’s estate type body design provides capacity for five adults in a very high level of comfort plus reasonable luggage capacity – increased of course by the 60/40 split folding rear seat facility and by the fitted roof rails ready to take a rack or a ski box. Add a 7-speed seamless changing automatic (and selectable) transmission to the package and the result is an immensely capable machine that is a delight to experience. The sheer capability of the vehicle is clearly designed for purpose. My earlier test of a 2-litre turbocharged Quattro version suggested that the driver could take it for granted. The same driving character applies to this larger engined example, the AWD system, proven over about 40 years, efficiently dealing with the demands of the prevailing road/track surface in such an efficient manner with minimal driver effort. This V6 diesel unit is probably one of the most refined oil burning examples currently available, getting the job done with hardly a murmur while delivering a claimed top speed of 155 mph and able to reach 62 mph (100 kph) from rest in a mere 8.2 seconds. That is fast and it is also pretty frugal, the official combined figure is 47.9 mpg though, with the help of the responsive start+stop system, one should see over the 42 mpg mark on mixed driving conditions. There is easy entry to the generous sized and very supportive driving seat that provides a good range of adjustment. Thus I easily achieved a comfortable driving position though I noticed that there is a slight support bias towards the left. Pedal positioning is excellent and the steering column is fully adjustable. Vision is also pretty clear in most angles. The fascia presentation on any Audi product always delights me – businesslike, immaculate, comprehensive and contained in stylish mouldings made from quality materials. It is a scene that, to me, generates an appreciative and relaxed mood. That this car is such a competent handling machine with bags of performance means that it can be appreciated by all types of driver – from the laid back to the discerning expert keen to optimise the responsive handling, the impressive grip, the immense stability, and the lightness of the controls including the confidence inspiring braking system. The overall size is just about right, the interior reasonably roomy, the comfort provided by the leather upholstered seating (heated at the front) suitable for long journeys with minimal fatigue and the basic equipment package fairly compressive though Audi buyers invariably draw on an extensive options menu when ordering their car. Thus this test car came with the leather/Alcantera upholstery, powered/heated front seats, an extensive technology package (satellite navigation and, music interface and parking system, adaptive headlights, a towing hitch, mobile phone preparation and a few more bits adding up to another £7,000 on the list price. A space saver spare wheel, I note is standard. Snow and ice did not materialise on this test exercise though I have experienced Audi’s quattro AWD systems under such conditions and appreciate the capabilities, especially when dealing with the sudden confrontation of mud on the road. The Avant body design (all metal parts are galvanised for long life) is versatile (including metal roof rails) and is sufficiently compact for easy parking and is that bit narrower than most off-roaders. MAIN RIVALS: Subaru Legacy Estate, VW Passat Estate 4-Motion. Price £38,005 – as tested: £45,040. Figures published by the UK Society of Motor Manufacturers and Traders (SMMT) confirm that 2,264,737 cars were registered last year, up 10.8% on 2012. This is the highest annual total since 2007 and represents a rise in 22 consecutive months. Worldwide, luxury manufacturer Jaguar-Land Rover sold an astonishing 425,000 vehicles. The UK is firmly secured as Europe's second largest car market and is the only one to grow consistently throughout the year. The 2014 market is expected to stabilise with sustainable growth of around 1% over the year. Best seller of the year was the Ford Fiesta (121,929), followed by the Ford Focus (87,350), Vauxhall Corsa (84,275), and Vauxhall Astra (68,070). Full details of all registrations can be found at SMMT car registrations. Business Travel News likes to be up to date with current events even if they are not to our palette. In marked contrast to overall sales the UK market for electric cars is slow. It is early days yet. Nissan is the leader with 141 new registrations in November for the Sunderland-built LEAF which takes total British sales past 3,000. Nissan’s second generation LEAF, which went on sale in May 2013 with more than 100 improvements on its predecessor, secured more than 1,300 UK sales in just six months. They still epitomise the best in British automobile engineering and whilst now each having separate German owners Bentley and Rolls-Royce seemed inevitably linked. Bentley had a record year in 2013, with a 19% rise in global sales despite diminishing demand in China and a shrinking luxury car market. The Crewe-based car manufacturer delivered 10,120 cars last year compared with 8,510 in 2012. Sales in the UK, Bentley's third largest market after the US and China, were up by a quarter at 1,381 cars in 2013. In Europe sales rose 11% to 1,480 cars. Sales in the Americas were up 28% at 3,140, but sales were down 2.7% at 2,191 cars in China. Rolls-Royce Motor Cars revealed record sales results for 2013. Globally during the year, 3,630 cars were sold, which represents the company’s fourth consecutive record. The result is announced in the 110th year of the marque. The all-new Range Rover Sport has been voted the UK's number one SUV in the large SUV category by the judges at What Car? The jurors picked the 3.0-litre SDV6 HSE model as their favourite, rating it ahead of Mazda's CX-5 2.2 Skyactiv-D 150 SE-L and the BMW X3 xDrive20d SE auto. The latter car has won the award for the past two years.